A bald eagle along the Housatonic River in New Milford. 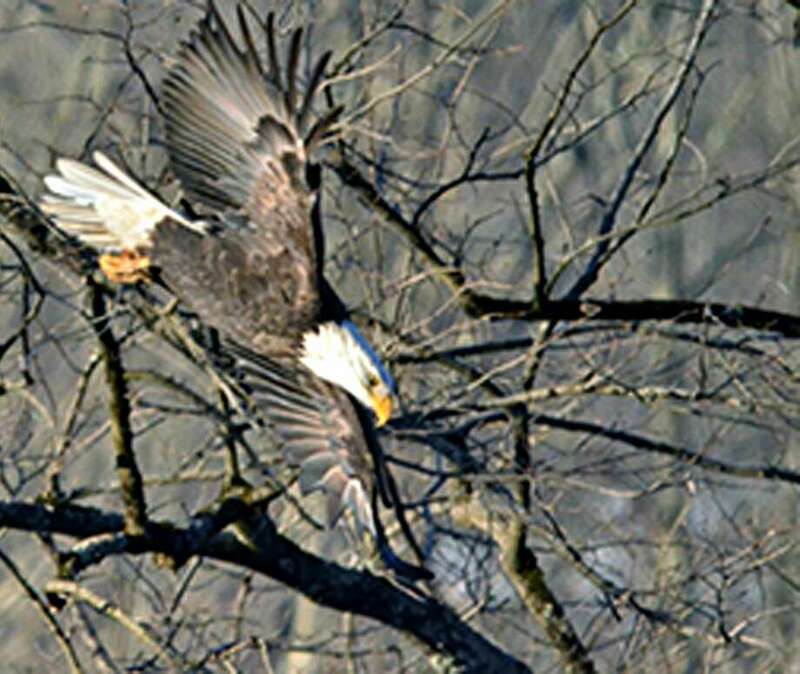 WASHINGTON — Residents took part last weekend in an effort to better understand the current bald eagle population in the state. Last year’s results of the Midwinter Bald Eagle Survey reported 166 bald eagles in Connecticut — the highest since the National Wildlife Federation started the survey in 1979. The survey is used to document trends in the bald eagle population over time. “It’s one of the longest, continuous data sets we have monitoring the state’s eagles,” said Brian Hess, a wildlife biologist with the state Department of Energy and Environmental Protection. Through the effort, volunteers keep track of the number and location of the eagles they see, when they see them, and what the birds are doing, as well as noting whether it’s an adult or immature eagle. That data is then sent to the DEEP, which leads the survey for Connecticut. The U.S. Army Corps of Engineers now oversees the survey for the country. Citizen science has become a bigger component for the survey to cover the large areas and gather observations. Citizen science is when non-professionals gather data or observations for meaningful science projects. Steep Rock Association was one the organizations leading groups of citizen scientists last weekend for the survey. Surveys are done all over the state, with most along major rivers and lakes where the eagles like to hunt and nest. Eagles have slowly been bouncing back, largely due to the elimination of DDT, a pesticide introduced in the 1950s to kill mosquitoes. But the pesticide worked its way up the food chain, from insects to fish to the eagles that prey on them. The chemical caused thinning in the eagles’ eggs, which cracked easily when they were incubated. Connecticut banned DDT in 1979. While there are more eagle sightings reported, Hess cautions this could be due to more people participating and documenting the eagles than more eagles themselves. He suspects there could be fewer sightings with the survey this year because there isn’t as much ice cover as usual. Connecticut’s eagles stay year round but the state also gets the northern eagles that travel south when their waters freeze over. Because of this, warmer winters tend to have fewer sightings in Connecticut. This could change if there is a cold snap though. The Housatonic is generally a good place to see eagles, especially at the Shepaug Dam in Southbury where an observation center is located. This is because the dam prevents that section of the river from freezing and the eagles can continue to hunt.